On one of our many days in Lyme Regis we came across Adrian Gray who balances stones and takes some pretty impressive pictures of them. They are quite stunning and again look to have that unexplainable edge about them. The cynical side of me suggested glue until there was a slight breeze which caused the stones to topple meaning the guy had to start again. 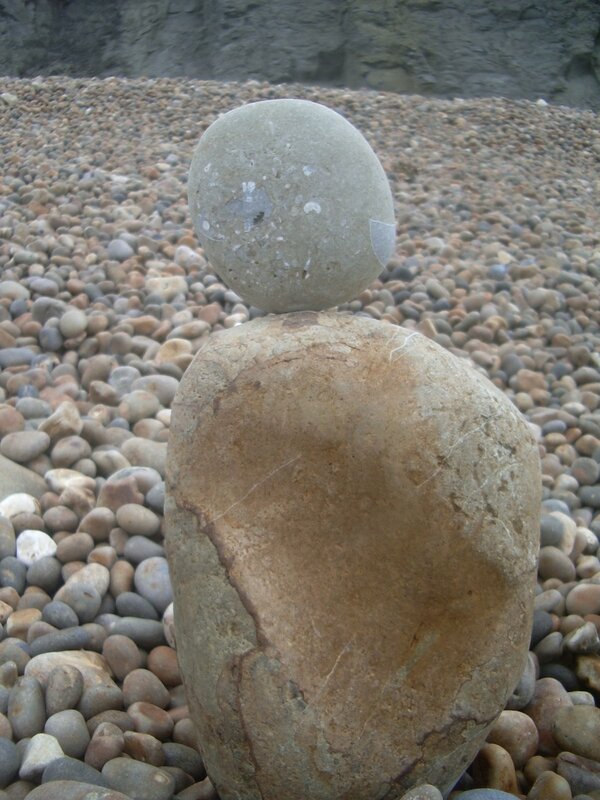 Well … one day while sitting on Charmouth beach as the children were rock-pooling I found two stones and after about 30 minutes of patience and ‘feeling’ the centre of gravity I was able to balance stones too! I was so proud I took a photo! Of course the family did not believe me when they saw the stones and I had to take time again to prove the stones did balance … but interestingly each successive time to balance them got shorter as I was able to ‘feel’ where the stone was at. Balance in life can be a bit like that – I guess knowing where our centre of gravity is and how do keep close to it can also be a bit of an art. This entry was posted in holiday by robryan65. Bookmark the permalink. Hi Rob Just prepping for a session at Greenbelt on God as Flow and found your post interesting which made me wonder is there a link between the spirit and “feel”. Hi Richardmmm – a good question. I think yhere could be a link between spirit and sensing when we are in step or out …. but the whole idea of ‘feel’ leaves me cold as the Spirit clearly works without us feeling anything.I probably have a tendency here to backlah after years of being told i should ‘feel’ different all the time after being in touch with the Spirit – change does not necessarily equate with feeling e.g being 40 felt no different than 39 but a definite change had occured.